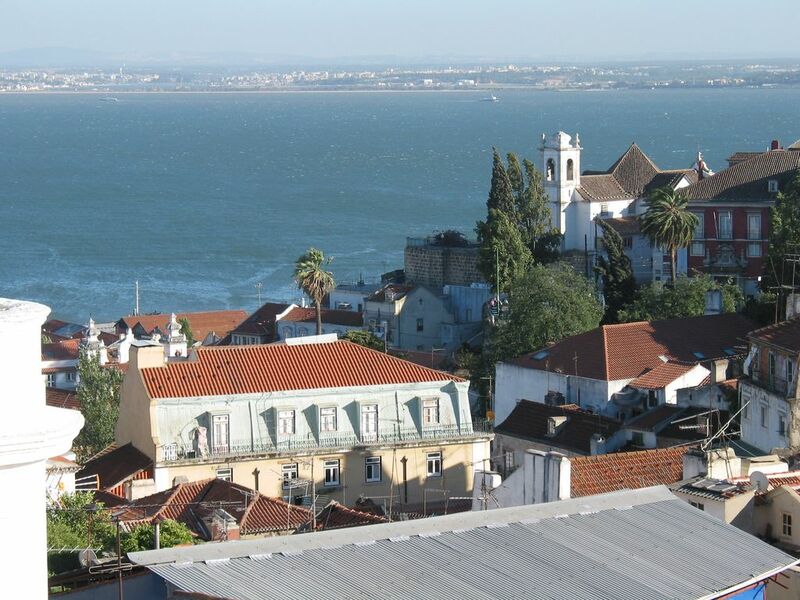 The apartment is located on the top floor of a restored house on the upper edge of Alfama in the historic center of Lisbon. The spectacular view and the characteristic atmosphere of neighborhood are fascinating. Further Details: The apartment has a very central location in a historic building in the heart of the old city of Lisbon. It is well developed and is on the tram line No 28. The Monastery of Sao Vicente, the Castle Hill and the streets of Alfama are a few minutes away. Go on city tours of this place of rest and enjoy the panoramic view from every window. Or stay in the apartment and enjoy the special atmosphere and the high, bright rooms. Further Information: We have a contact person who speaks English and French on site. If you have questions or need help, she is happy to help you. If you have further questions on housing and the environment, you can call us. You can reach us at the telephone number 0041 7942595 06 (see below). Specials:: Enjoy a freshly squeezed orange juice in the winter! Electric ray heater in bathroom. The apartment has a very specific layout, a tour of all the rooms. The two rooms have a double bed and have access to the porch, where the two bell towers of the monastery 'São Vicente' through the branches of the trees are visible. The large kitchen is fully equipped and, if necessary, use of the washing machine and laundry dryer available. Beside of it there's a living room with Sofas and a separated dining room, the two of them offering a lovely view of the castle hill. The apartment has 2 mobile electric heaters which can be put in any room if desired. We have our own WLAN. Caretaker:Paula was kind and helpful. This apartment is in an old building on 4th floor on corner so lots of lovely views over the city towards the port and inland. It is decorated in old fashioned style which is very charming. Has most of what you need even for a longer stay. No washing machine but hand washed items dried in a few hours on outside lines. Reasonable wifi coverage. Spacious and airy, can get breeze through rooms although no air con. You can walk from here to many of the sights or use the metro, trams, trains or buses to go a bit further afield. Lots of places to eat and drink as well as buy food close by. Prices seemed very reasonable despite the poor exchange rate. We loved it. Thank you for your feedback, Sarah. Always welcome again. Josef’s apartment is beautiful with gorgeous views and the location is very convenient. A charming clean apartment. The views are amazing from this apartment. It is well worth the walk up the stairs to get to the apartment. It helped walk off all the great food in Lisbon. There are lots of restaurants and bakery shops nearby. We were able to walk to all of the main tourist sights. Granted it is very hilly, but so nice to walk around in this beautiful city. The apartment has so much character with all the antiques and cheerful colors. The kitchen was well equipped and the beds were comfortable. There was a little street noise with the windows open, but it wasn't that bad. There was good WIFI connection. Good communication with the owner and quick responses. We would definitely stay here again and would recommend it. Charming, cozy and centrally located! Loved staying at this place! The panoramic views were stunning and MANY huge windows created a much-needed cross-breeze. Didn’t even miss the AC! (Note to light sleepers: the birds are quite active in the early morning. A white-noise app will do you wonders!) The location is great - lots of things to see in the area and a short walk to tons of others. Very close to grocery, multibanco atm, restaurants and shops. Paula, the neighbor and our contact, was very nice and helpful. Would stay here again and highly recommend! The Travessa das monicas is a quiet street in the midst of a very lively old town quarter. You'll find many cultural attractions here, as well as good shopping. The house is located at the intersection of the three Old Town districts of 'Graça', 'Mouraria' and 'Alfama' in the heart of the historic Lisbon, with its picturesque streets. Many of the old houses have been renovated in recent years, many are still there. Enjoy the unique 'village atmosphere' in the heart of the World City of Lisbon.